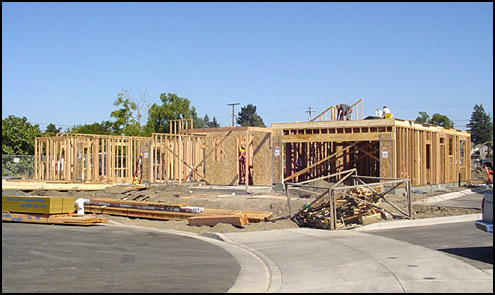 The first-floor framing is underway on the two-story homes at Land of Victoria. The Land of Victoria subdivision built by Carco Homes was an interesting infill project that took shape off of Hearn Avenue just behind Mead Clark Lumber. Located off Victoria Drive is David Lee Court, a small cul-de-sac that has six single-family homes plus two duplexes, that can also be accessed off Hearn Avenue. This is where the Land of Victoria sits. These single story homes are across the cul-de-sac from the two-story homes. These homes were built as opportunities for entry-level homebuyers. They are primarily single-family homes ranging from 1400 square foot single story to 1700 square foot 2 story. The two duplexes are at about 2200 square feet. All homes have attached two stall garages. 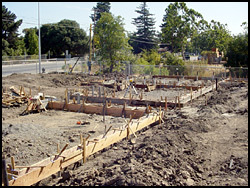 The two duplexes with LeDuc & Dexter’s under slab plumbing competed. 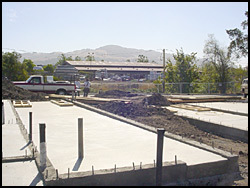 LeDuc & Dexter was the plumbing contractor and they had completed the under slab plumbing for all of the homes while they were in the framing stage of construction. Carco has been a long-time customer of LeDuc & Dexter. A seven-foot sound wall will separate the new homes from Mead Clark Lumber. These eight residential structures are located in a heavily traveled area near the Corby Auto Mall, but with a 35 mile per hour speed limit, the subdivision is relatively quiet. 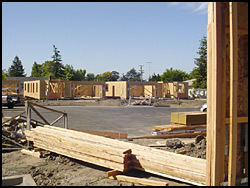 A seven-foot sound wall was intended for construction in the back of the development to shield the sound from Mead Clark Lumber, which is located just down the street from LeDuc & Dexter’s office.